As I was saying, since we’ve already covered a handful of outstanding up-and-coming anime creators, chances are that people who follow these Anime’s Future posts have started noticing patterns in their careers. There’s the youngsters who entirely bypass long formative periods (actually quite rare, but the inherent bias of this premise makes them the majority on this series), as well as the ones following more traditional roads and still finding early success through skill and perseverance. No matter which of the two paths they took though, there was a clear trend: most of these artists were freelancers at some point if not for their whole (short) careers, jumping around all over the industry. This is no surprise when most anime creators have no long-term, exclusive attachment to companies, but they contrast with the cases we’re about to present today. After all, when it comes to Kyoto Animation, things don’t work the same way. Artists join them while very young (you must be under 25 to even be considered a candidate), usually with no prior experience in the industry at all. If anything, often you’ll find that their major exposure to anime tends to come from having studied on the studio’s own school, where directors and animators act as instructors. After that, they stay at the company and work solely for them for as long as they want. The studio’s complete isolation from the rest of the industry makes them a fascinating case study, and considering how talented their new generation is, they deserve at the very least one of these articles focused on them. But let’s waste no more time. After wraping up her studies, Haruka Fujita joined KyoAni in 2010 as her first venture into animation. She trained for a while drawing in-betweens, but she cleared that stage so fast that she was only ever credited for it in the Nichijou OVA preceding the series. 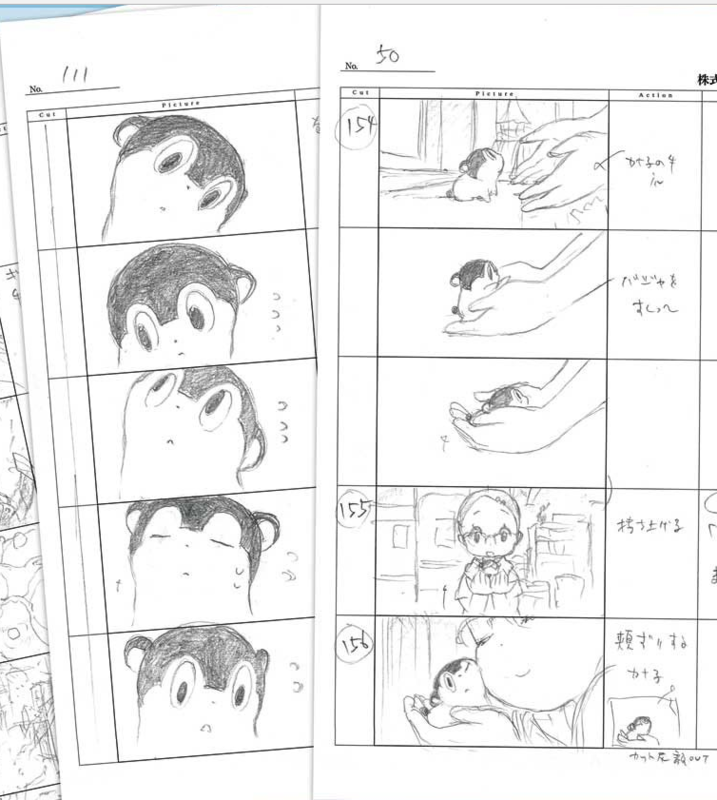 By the time the TV show started she was a regular key animator, and come Hyouka she was starting to get entrusted with promotional illustrations and important scenes. 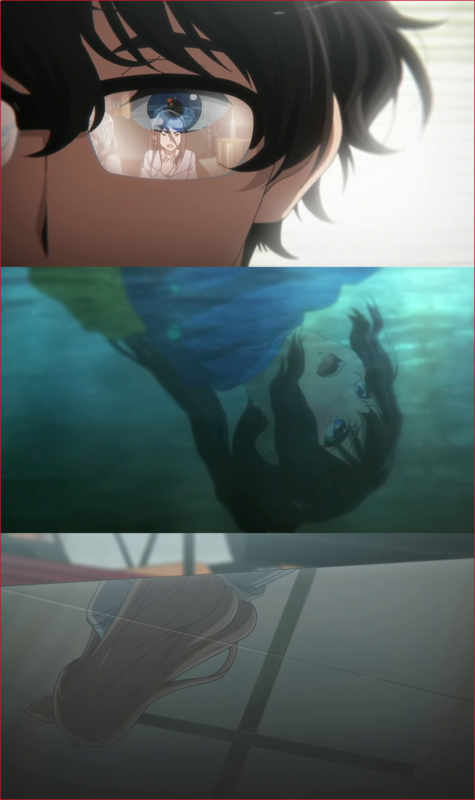 One that stands out, as she herself confirmed she had animated it, was the cast’s overreaction to Oreki showing some curiosity in episode 18 of the series; while this role reversal isn’t an all-time display of incredible draftsmanship, it shows the acting thoroughness that creators at the studio need. It’s important to note that, even though Fujita was first noticed as a director, the staff trust her so much as an animator to this date that she was one of the three KA who worked on the latest Violet Evergarden commercial, alongside the studio’s two sakuga aces. The studio explicitly only recruits animators with an aspiration to direct – not because all of them will do it of course, but because the ones who get promoted must have a great understanding of animation when it’s their turn to storyboard. Because rather than isolated pretty shots, the backbone of the studio’s storyboards ever since Yoshiji Kigami became their mentor has been the articulate, believable character acting. And that can only happen on a consistent basis if the directors themselves guide their animation teams. With that in mind, it’s easy to see how Fujita has quickly become the poster child of KyoAni’s new generation. 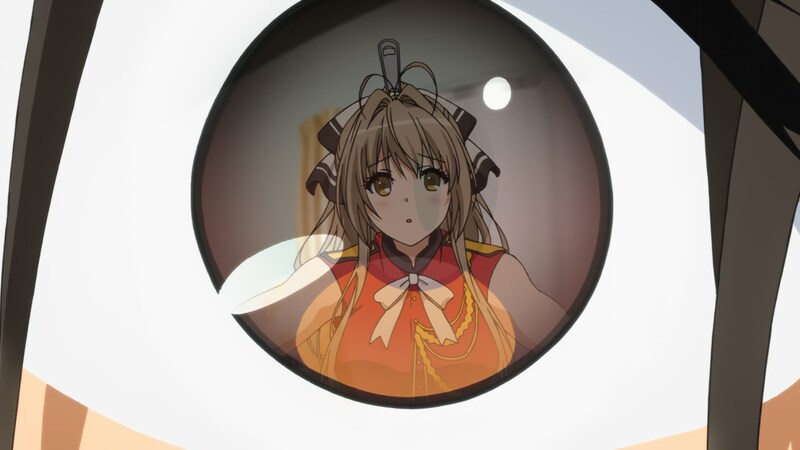 After training under the likes of Taiichi Ogawa and Naoko Yamada, she had a timid storyboarding and directing debut (as it tends to go) on the second season of Chuu2Koi, followed by an episode of Amagi Brilliant Park, where some of her quirks started becoming apparent. And then came Euphonium #8, a masterful work that blew everyone away and quickly gained her many fans. It was quite amusing to see industry members, animation academics, and fansites alike crowning her as the new future queen of the studio overnight, though thankfully for them all it turned out not to be a fluke. It’s not as if her skills suddenly skyrocketed, of course. 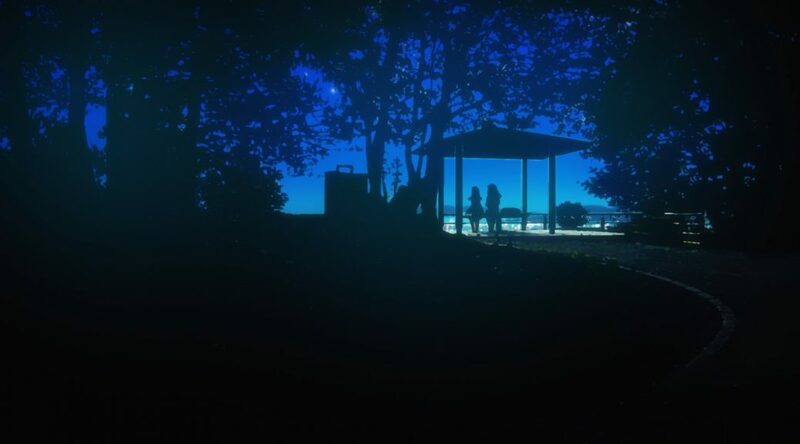 Euphonium as a whole simply provided an excellent framework, and that episode in particular was meant to capture an intimate dream-like moment – all in all, the perfect circumstances for a talented youngster to prove her worth. Admittedly, the result was still outrageously strong considering that was only the third episode she was fully in control of, but her meteoric ascension didn’t start out of nowhere as it might have seemed. You might be wondering what makes Fujita special as an individual, why she’s a director worth paying attention to. It sure isn’t her love of sharks and plants/flowers, which she makes no effort to hide. And it’s not her fondness of a certain charming smile, although that comes closer to her actual directional quirks. Despite not having handled all that many episodes still, she has enough of a distinct approach that telling apart her style has become quite easy. For example, Fujita has a strong tendency to use reflections to politely peek onto people’s most passionate feelings, since those often burn so bright that staring at them directly would blind you. 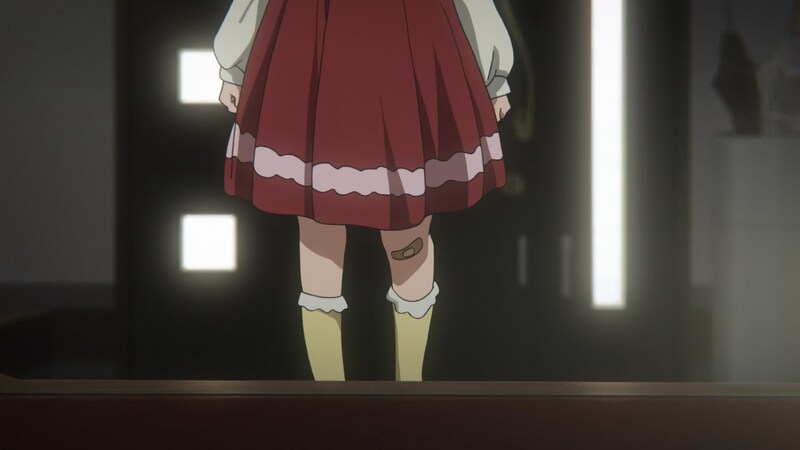 On a more conceptual level, I would also highlight her understanding of fiction as something that exists beyond the moments showcased in their work; Taiichi Ogawa mentioned that it was Fujita who naturally gave child Reina a bandaid on her knee, because of course that her adventurous young self had scrapped it. That is obviously never mentioned in the episode itself, it barely makes an appearance and is frankly entirely irrelevant to the events…which is why it exemplifies her attitude so well – much like her major influence Naoko Yamada, Fujita sees characters as people whom she films for limited periods of time, but who also exist beyond that. And when it comes to her guidance for visual departments, her preferences have become clear as well: the colors in particular, since the Fujita Purple accompanies her everywhere. She has also been absorbing Ishihara and Yamada’s sense for photography, but as beautiful as the composite in her episodes is, I don’t think she’s really developed her own voice in that regard. And truth to be told, I don’t think it’s those idiosyncrasies that make Fujita so special. The combination of them all and her surprisingly mature directional sense make her work very appealing, but I would argue that she’s an even more interesting creator within context. Fujita is the culmination of KyoAni’s core philosophies over the last decade, arguably even more so than Yamada herself. Both aesthetically and on her approach to portraying life, she’s a fantastic director who could only exist now and there. We’ll likely not see her handling her own series anytime soon, since the studio’s oversaturation of directional talent has been slowing down the final step of promotions. But no one doubts that it will happen, and that she’s already one of the brightest stars at quite the anime powerhouse. I’d like to end with a very brief entry, returning to someone whom we’ve already introduced to the readers of this site but that fits the theme of the article. If Fujita is KyoAni’s hope on a directional level, then Akiko Takase is in the same spot animation-wise. Thankfully, her career is short and easy to sum up. As an animation student she was blatantly fond of the studio’s work, so right after graduating she joined them. And ever since then, she’s been smashing their precocity records. 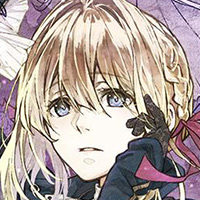 To be more precise: she first skipped staying as an inbetweener, got immediately tasked with the gorgeous art of Violet Evergarden’s novels, and then was allowed to keep commanding that project even its transition to animation. As a consequence of that, she was also promoted to regular animation direction duties despite her lack of experience. 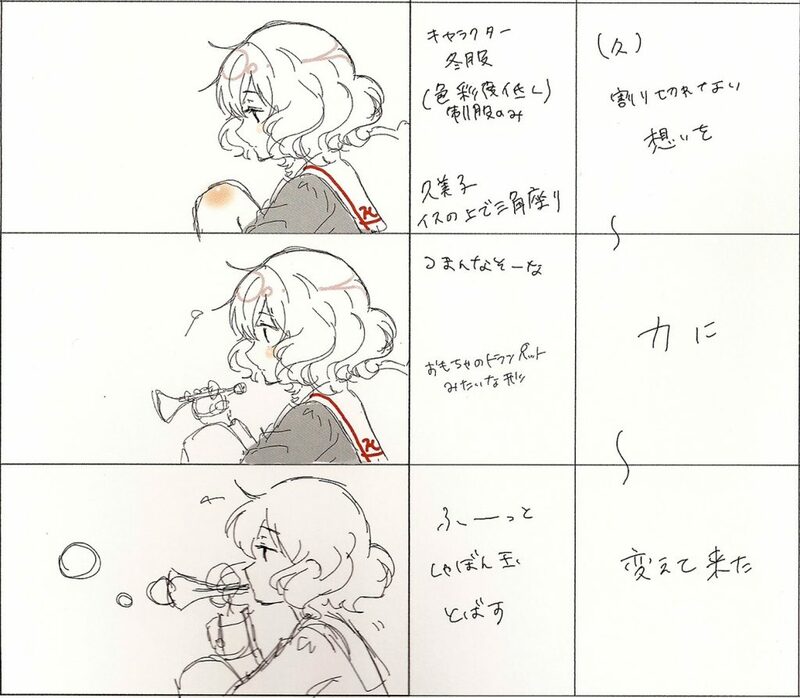 And you’d be forgiven to be skeptical about her work supervising animation, considering that she has the soul of an illustrator and her drawings have so many lines (something older staff have teased her about) that they appear unfit for motion. As it turns out, one episode – her very first – was all it took to disprove that. 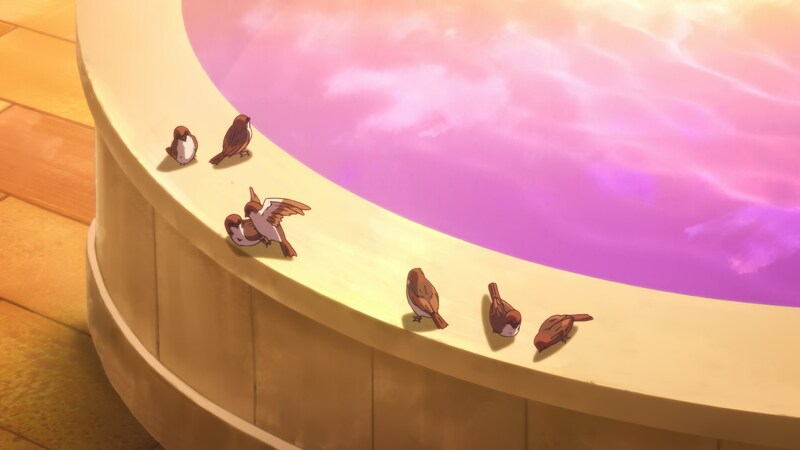 Euphonium S2 #9 created life through movement, all while maintaining Takase’s intricate art. We tend to take stylization as the root of good animation designs, but what’s actually most important is having a grasp of how every element acts while in motion, and she seems to have already developed that sense. This might be hard to comprehend if you don’t actively try to dissociate animation from productions as a whole, and obviously if you don’t follow studio members themselves, but KyoAni actually took a notable blow around 2014. The departure of Yukiko Horiguchi and Nao Naitou hurt them, as they undoubtedly were two of their greatest animation talents. Their lineup of supervisors was weakened to the point that many youngsters have been promoted over the last years, and if it weren’t for the studio’s unmatched stability and planning prowess, the quality of their work would have taken a nosedive. Thankfully for them, that facilitated the appearance of new figures like Takase, so now they rest assured once again. It’s not as if Takase is a substitute of Horiguchi, since their styles are worlds apart – Horiguchi was a veritable master of cartoony sensibilities, whereas Takase mixes shoujo manga influences to create a very ornate reinvention of the predominant aesthetics at the studio. What does bring them together is the belief that it’s animation that gives life to the characters though, and that’s something the studio needed. Her first major project Violet Evergarden is quickly approaching, but I already can’t wait for whatever is coming next. Takase is one of the most promising designers and animation supervisors of this generation in the industry as a whole, let alone at her studio. The two of them both made big splashes with their Sound Euphonium episodes. I particularly loved the duo of Ishidate and Takase on S2 Episode 9 considering how utterly gorgeous both he shots and the details of the characters were. Violet Evergarden has the potential to be a new benchmark of what TV can be visually if they put their all into it. Also, yes, Takase has an incredible sense of fashion. Well dressed anime characters is one of my favorite things. Horiguchi has been providing illustrations for books under pseudonym 白身魚. Recently she’s also provided character design for idol group 22/7. She designed one character herself and unified designs of other participants. Both of them took a long break from animation, and that means leaving the studio. Naitou’s returned ( though she barely does any work) in freelance form with ties to A-1, whil Horihori is still away from animation. As YouSay mentioned, she’s been acting more and more as an illustrator under the shiromizakana pen name she’s had for years. 22/7 might be her return to animation, but nothing’s been confirmed. 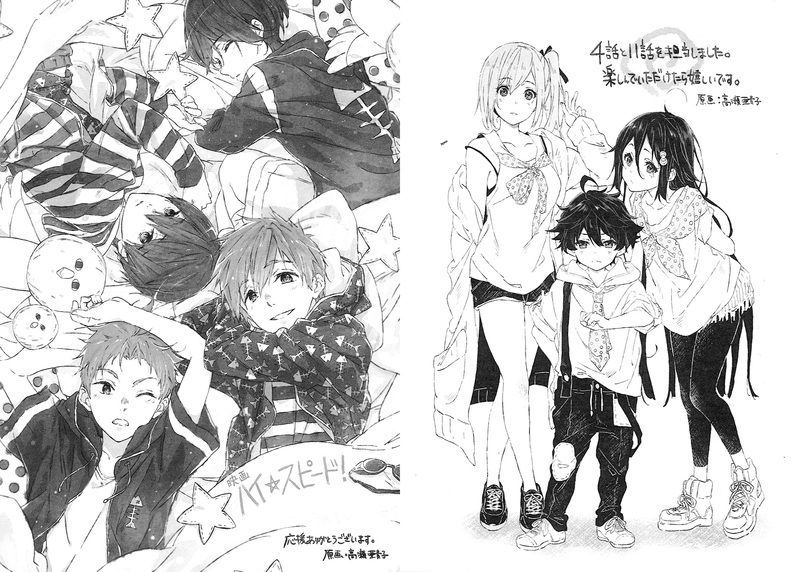 Does KyoAni actually explicitly say that they only take people younger than 25? Is that sort of age discrimination legal in Japan? It says so in their guidelines, and I don’t recall exceptions in their recruitments. Also I’m not sure why you’re even asking that, anime studios act like this all the time. Sometimes they go as far as saying the newcomers must have no experience in animation whatsoever so that they absorb their own way of doing things. The only difference is that they do it as a general rule. Haruka Fujita and Akiko Takase really are two of the most talented young ladies in the industry.